Though a hearty addition to any meal year-round, this colorful salad is perfect to make in the summer when farmers markets, produce stands, and food coops abound with local veggies and fresh herbs. Packed with protein and rousing flavors, it can serve as the main course or as a side dish in a larger spread. If you don’t have all the ingredients, just improvise. What’s listed simply represents a framework for experimenting with all sorts of different combinations that will vary the dish’s texture, flavor, and colors. Keeping all the veggies and aromatics to a fine chop will ensure that those textures, flavors, and colors are evenly distributed throughout the salad. Chopped avocados, black olives, green peppers, and tomatoes are among many other good additions or substitutions. And, any robust vinaigrette will add the needed acidic kick that makes up a praiseworthy salad while the aromatics can be in any assortment that suits your taste. Because I find chopping and dicing ingredients to be extremely relaxing, this recipe is a particularly appealing one for me to prepare and then, of course, to sit down and thoroughly enjoy. Thoroughly rinse the beans and the corn under cold running water until the water runs clear. Drain completely and pile into a large bowl. Sprinkle generously with red wine vinegar, up to 1/4 cup, and gently stir to coat the mixture completely with the vinegar. Set aside. In a medium bowl, prepare the vinaigrette by adding the garlic to the olive oil and whisking until combined. Add lime juice, oregano, basil, cumin, salt, and freshly ground black pepper and whisk again. Set aside. Finely dice the celery, jalapeno, red pepper, shallots, red onion, scallions, and capers, adding each directly into the bowl of beans and corn. Pour vinaigrette over the entire mixture and stir gently until thoroughly combined. Roughly chop the cilantro and parsley and add to mixture. Gently stir one last time to thoroughly combine all ingredients. Cover tightly and refrigerate for at least one hour to meld the flavors. Remove from refrigerator and let sit out at room temperature for 15 minutes. Serve piled in a bowl family style or individually in an upturned leaf of lettuce on a plate garnished with a sprig of parsley. 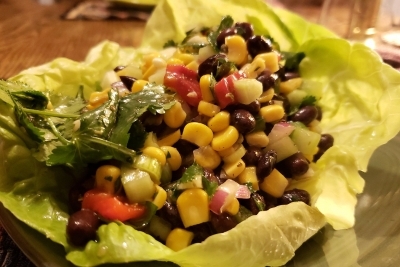 It can also be served salsa-style with tortilla chips.